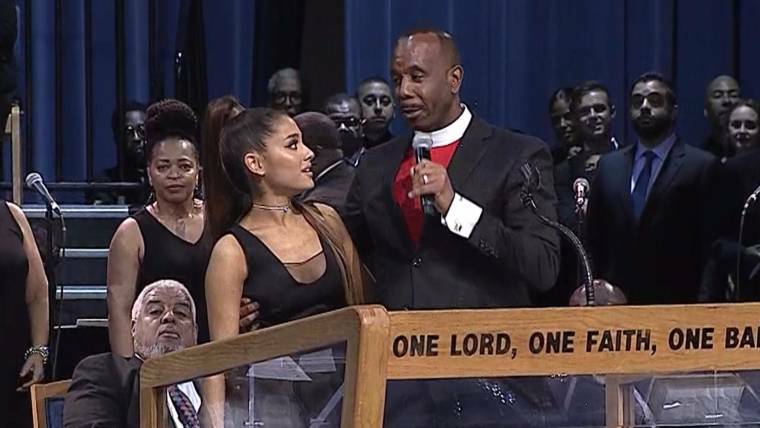 The internet was buzzing over the weekend after Bishop Charles H. Ellis III apologized to singer Ariana Grande after he was seen touching the star at Aretha Franklin’s funeral in a way that some described as groping. But many on social media were uninspired by the bishop’s response to accusations that he inappropriately touched the pop princess on live television. “The most important requirement of an apology is accepting responsibility for what you did wrong, and owning up to it. This isn’t an apology,” Kelly Ellis, a software engineer, tweeted. “Girl, let me give you all your respect,” Ellis said, as he put his arm around Grande’s waist. But those watching the funeral couldn’t help but notice Ellis’ hand climbing higher as he spoke to the petite singer, eventually moving his hand up Grande’s waist until it landed on her breast. On Saturday, Ellis apologized for the accidental touch. He said he hugged all the performers that day, saying gender wasn’t a barrier. Those on Twitter were lukewarm on Ellis’ response to the allegations of groping. “He believes this is friendly? This way of thinking is the problem. That touch was on a sexual spectrum,” she wrote. The moment birthed the hashtag “#RespectAriana,” and on Sunday, many tweeted that Grande should not have had to endure the alleged inappropriate touching. As of Sunday, Grande had not publicly responded to the apology.